The average dad suffers 22 injuries a year – because of the kids, it emerged yesterday. 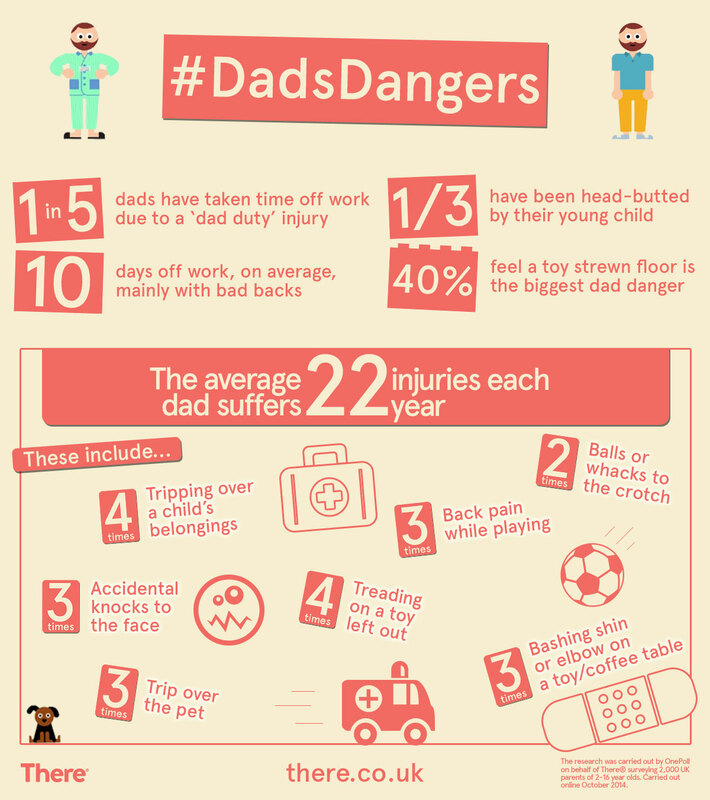 From accidental kicks to the face to bad backs from being a human climbing frame, the wear and tear on Britain’s dads was revealed in a study of 2,000 parents. In fact, the average dad of school-aged children experiences 22 injuries per year – eight of those while playing with the little ones. And dad also bashes his shin three times on something the kids have left lying around the house and steps on a toy or plug four times a year on average, results showed. Nearly 40% of Welsh dads even felt that to walk across a toy covered floor was the most dangerous aspect of being a parent. And four times a year dad stumbles on an item of clothing or other belonging that’s been left out, while the dreaded prospect of an accidental hit to the crotch faces men with young children twice a year. Yesterday Clive Allison, Head of Member Recruitment and spokesman for new family-focussed insurance brand There®, which commissioned out the research, said: ‘’Every dad wants to be able to play with their kids and make the most of enjoying those early years before the children quickly grow up. ‘’Clearly that comes with a few inevitable knocks and injuries when playing around outside or on the sofa or even trying to keep up with them in a football match. In these instances, the average time Welsh dads were off work was 7 days, most likely through injury to the back results showed. Few dads have illness cover in place to protect in case they are too ill to work. In fact dads are much more likely to have insurance to protect their mobile phones, pets, and holiday bookings than to protect themselves. Only 15% of Welsh dads polled had any illness cover in place and fewer than half the dads polled had life insurance, with a fifth saying they just never had time to sort it. “Given the bashing that dads get in their ‘line of duty’, it’s surprising that so few think about how they would manage if a more serious injury were to happen. In fact the research shows that they’re more likely to financially protect their phones and pets than they are themselves. “We know that insurance drops down the priority list because it can be full of jargon or complicated and life just gets in the way. So our new There-in-one plan offering life and Too ill to work cover, is deliberately quick and easy to put in place with much less jargon or small print. And as the cover can be set by the customer to meet their budgets, it makes it easier to protect the life a family values. Source: The research was conducted by OnePoll on behalf of There® surveying 2,000 UK parents of 2-16 years olds. Carried out online October 2014.